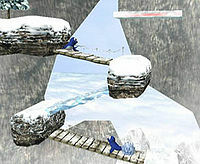 Icicle Mountain is a default stage in Super Smash Bros. Melee, originating from Ice Climber. It is where the game Ice Climber is set, and it is located in an area called Infinite Glacier. The stage is home to the Ice Climbers, and is where most of the battles against them are held. The place takes one the typical appearance of a frozen mountain. The stage itself is highly altered from what the game mountain looked like in Ice Climber. The stage is replaced by The Summit in Super Smash Bros. Brawl. Icicle Mountain also appears as stage 10 of the Adventure Mode. There, Topis, Polar Bears and Freezies are on the stage, along with two pairs of Ice Climbers. The main feature is that the stage scrolls up and down, and players have to keep jumping on the platforms to survive. It is easy to get knocked off the sides of the stage, or even get pushed too far below or above the screen. If this happens, the player will lose a life. The stage also has ice blocks that can't be broken, unless an item is used on it. This is dangerous, as it can stop the player from jumping to a higher platform. An alternate music track of the stage comes from the game Balloon Fight. The Japanese version of a Topi is a seal creature. The screenshot of Icicle Mountain on the stage select screen displays the seals. This page was last edited on April 6, 2018, at 13:39.